1. Templates tailored for specific applications enable easy creation. By selecting a template suited to each application and editing the text, swing POP ads, price cards, banners, seals, window signs, etc., can be easily created even by those who have no experience in using design software. The template will be available on our website and to download for free additionally. The template is planned to update as needed. Templates can be chosen based on applications, purposes, events, etc. Select text and change the content. In addition, text can be newly added. In addition to OS fonts, there are more than 200 Simple POP original fonts available to choose from. Image files you can insert are jpeg and bmp files. The inserted image can be intuitively edited, such as resizing, rotation, and movement, with a simple mouse operation. Images that are already placed on the template can also be edited. Graphic symbols such as circles, polygons (triangle, quadrangle and star) can be inserted. The inserted graphic symbols can be intuitively edited, such as resizing, rotation, movement and color change, with a simple mouse operation. Images can be cut out in self-contained graphic forms. 2. Print and cut data for POP and in-store decorations can be created easily. When you try to create shop's original POP display and other decorations such as price cards, there is a need to outsource the creation to design companies, web-based online services, etc. However, such outsourcing has problems such as design and print costs, minimum order quantity, and lead time to delivery. The "Simple POP" templates have pre-installed cut data, which enables you to perform print and cut operation in house by outputting such data using our "UCJV Series" with a cutting function. The cutting function enables automatic and proper production of displays even in a form other than square, which would take time and effort when they are manually cut. Quick posting of the shop's original bargain POP ads and price cards according to the sales of the day and inventory availability can contribute to an increase in sales. 3. Automatic cutting improves work efficiency. Even for square-form price cards and POP ads, it takes additional man-hours when they are manually cut using cutter knives. With the "Simple POP", data can be created easily and printing and cutting processes are automatically performed by using the "UCJV Series", which can save time for another task and improve work efficiency. 4. Print on transparent, colored or metallic media is enabled by using white ink. White ink with high hiding power can be used in the "UCJV300 Series" printer. Using the white ink as a base for color prints on transparent, colored or metallic media helps increase ink color development and achieve beautiful prints. This is an inkjet printer equipped with UV curable ink and capable of printing and cutting processes all by itself. 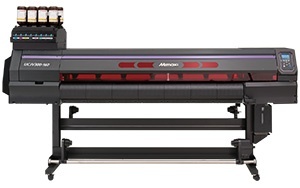 In addition to its UV-LED printing and print & cut function, this high-spec model has a multi-layer (such as four- and five-layer) print function (*1). The all-in-one printer can handle a broad range of work, from a short delivery job to billboard advertisement that goes ahead of the times. There are 75, 107, 130 and 160 width sizes (*2) available to suit your installation space and media width. *1: The multi-layer print is only available for UCJV300 Series. *2: The 75, 107, and 130 width sizes can be specified only by the UCJV300.